In preparation for our son and his now wife to get married in our yard, we began renovating the yard. We spent almost every day from October 2016 to June 2017 planning, shopping, hauling, digging, planting, and more planning, shopping, hauling. . . you get the idea. It was an intense project. Around January 2017 I realized after such busyness, it will be a letdown with nothing to do after the wedding. I needed a project to get me through After The Big Event Slump. I thought about what I had wanted to do for a long time . . . produce a book for writers. And I thought of the writers in my Jumpstart writing workshops. Over the years gorgeous writing has evolved from this group. I formulated a plan and got to work. I gathered writing from Jumpstarters, organized the contents, and sent everything to Jo-Anne Rosen, book formatter extraordinaire. Through her magic, The Write Spot to Jumpstart Your Writing: Discoveries was published. Discoveries reveals techniques used in Jumpstart Writing Workshops. Whether you want to write fiction, memoir, non-fiction, or poetry, or if you are experiencing writers block, Discoveries will inspire your writing and open doors for self-discovery and transformational writing. 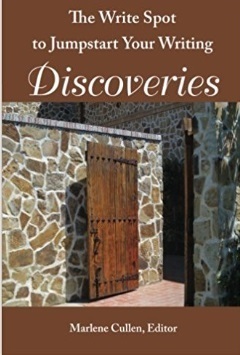 The Write Spot to Jumpstart Your Writing: Discoveries is available for $15 at Amazon and Book Passage (Corte Madera). Can anyone write? Yes, as Marlene Cullen reveals in this delightful anthology she has assembled that scans a variety of tales and styles of pure reading pleasure. From poems, stories, and short essays, we learn of a tussle with a barbecue, of pondering one's place in the universe, mulling lessons from Kmart, and musings on Prince Charming, and soap. There's something for everyone in this collection that brims with hidden talented voices that speak a little something to everyone. Marlene Cullen has created a simple, concise format that will instantly inspire you in your own writing. Each collection of poems and short essays will carry you away to different times and places with a hidden gem at the end of every chapter where each author leaves you with “words of encouragement” to help you start writing your own stories. In the chapter on “Writing Resources,” Marlene Cullen gives you the tools you need to have confidence and joy in your writing. The list of recommended books on writing is invaluable. This book is a gift to yourself and one that you will refer to often when you need inspiration. Marlene's book of simple but touching stories and poems has inspired me to write again after a long dry spell. Reading other's stories helps me realize we are all sharing the struggles and joys of life in our beautiful world. Reading this anthology is like walking into a word bazaar, where the reader is called to taste grief’s shadows, to sample sweet memories. The reader is beckoned by the poetry of human existence, lured to the scents and sounds of places and times. Savor this visit to worlds familiar and unfamiliar. You will leave, feeling satisfied. Book groups proliferate so why not writing groups? That old beatnik, pre-hippie poet, Kenneth Rexroth said, “Against the ruin of the world, there is only one defense: the creative act.” And with so much unease in our society, with threats of war, polarization of political ideologies, hurricanes and fires why not diffuse some of that negativity by creating? Let us write stories, and poems, and essays, perhaps to stave off some ruin and stay semi-sane at least. Marlene Cullen is the creator of Jumpstart Writing Workshop. In a comfortable, non-threatening atmosphere, participants write and write and write. Their products turned out be so compelling that she wanted to share them with all of us. 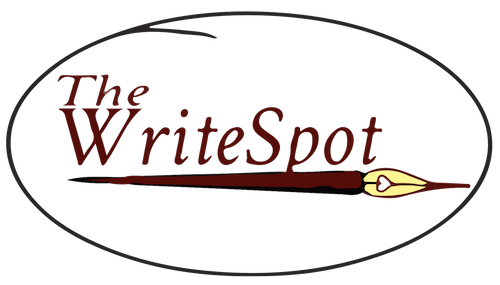 She has assembled a charming anthology entitled The Write Spot to Jumpstart Your Writing: Discoveries, a compendium of all different kinds of creative acts and for each selection the creative process is described in detail. Writers are given a “prompt.” At the end of each piece we are told exactly what the inspiration was. For example, one writer recounts a comic interlude with a recalcitrant Weber BBQ. The impetus for this was, “write about a leap you have taken.” At the end of each author's section there is a mini-biography and some words of encouragement that describes their process. Part of the delight elicited by this collection is the disparate range of topics. This little book includes something for everyone’s preferences. Subjects include old-fashioned laundry rituals, the great hot lunch, cold lunch school dilemma, hormones, romance, gloves and soap. The ending segment reads like a lesson plan to start a writing group of one’s own. There are hints on what to do if your creative juices are stuck, a list of prompts and a generous bibliography. Entries are short and in our busy, very busy lives it is easy to pick up the book and read a few inclusive selections and then put it down for another day to discover a different author's work. Diane McCurdy has a BA from SF State and an MA from SSU in English Literature and several teaching credentials.